SAINT-QUENTIN-EN-YVELINES, France – The United States may have suffered another chastening Ryder Cup defeat on European soil, but there was no repeat of the highly charged news conference that followed their loss at Gleneagles as Phil Mickelson hailed the “phenomenal leadership” of Jim Furyk and his vice captains. After the USA’s loss in Scotland four years ago, Mickelson was openly critical of captain Tom Watson’s decision-making in a horrendously awkward media conference. Perhaps unsurprisingly, Mickelson and his teammates were at pains to present a united front on this occasion, with the veteran left-hander insisting Furyk and his backroom staff could have done no more. 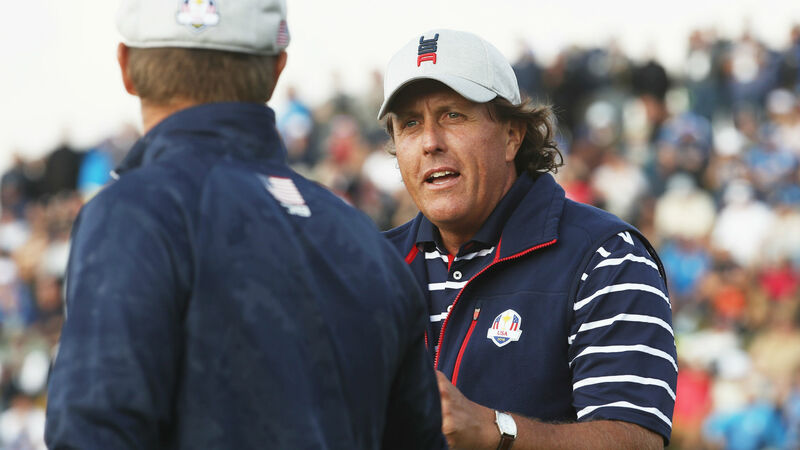 “This is an awesome team and we had phenomenal leadership,” said Mickelson, who lost both of his matches at Le Golf National as the US were beaten 17.5-10.5. “We had great vice captains. And we were put as players in a position to succeed, and these guys up here are such great players that, if you put these players in a position to succeed, they most often will. “Unfortunately, it didn’t happen this week. But we had a very special week here. We’ll continue to build on it, and improve in a couple of years, and this is a very meaningful, special team for me personally too, because our captain is one of the best people in golf, and somebody that I’ve always looked up to and cherished our friendship. “I thought that the way he brought everybody in together on decisions … some of you might question some of the decisions, but everything was done with reason, input, thought through, and then it’s up to us to execute, and we just didn’t quite execute. “And let’s be honest. The European side played some exquisite golf. I mean, it was some phenomenal golf, and they flat-out beat us. But they beat us on the course. Another rookie, Justin Thomas, finished the week as the USA’s leading points-scorer, beating Rory McIlroy on the 18th on Sunday to record his fourth win from five matches. “I would gladly go 0-5 every Ryder Cup my entire career if that means we win every single time that we play. It’s not a fun feeling,” said Thomas.